Take your stands outdoors with these weather-friendly displays. Choose from our range of portable branded plinths, wooden counters and glass displays. Looking to exhibit? See our wide range of stands suitable to use in a shell scheme space. Help your business to be seen with these Marketing Materials. Pick your accessories to add the finishing touches to your display. Brand new and stylish freestanding or wall mounted digital advertising signs. 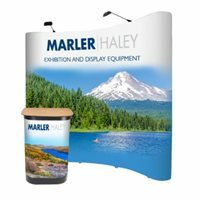 Display stands are a key ingredient to exposing your brand at a trade show, conference, job fair or any other event that requires your stand to do the talking. Pairing the right kind of exhibition stand with a good, solid design can speak volumes about your business and the products/services that you offer. We offer a comprehensive range of display options to suit your every need. From pop up stands, banner stands to display boards and outdoor advertising, we have everything covered. As a specialist in large format printing, we can print on a variety of materials including PVC, foam board and fabric to custom shapes and sizes. If you have a custom requirement, please contact us for a quote today. 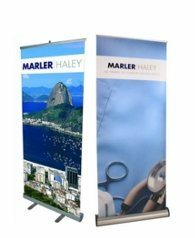 Pull up banner stands are portable pop up exhibition displays that are designed to carry an eye-catching graphic. 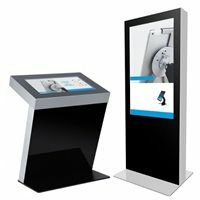 They are ideal for use at exhibitions, conferences, retail outlets or in any public building. They are lightweight, easy to use and are ideal for one person to carry and put up. Marler Haley’s state of the art graphics guarantee no edge-curling and no de-lamination, delivering your message with maximum impact. 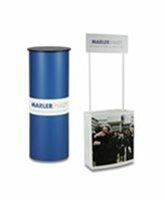 The stand base comes with a 5 year guarantee to give complete peace of mind that your banner stand will be a great investment. Pop up Stands create fantastic backdrops for events. Whether you need a curved or straight stand, we have them all – and in multiple sizes too! We’ve even made your exhibiting life easier by offering a complete stand package which includes a counter which doubles up as a transport case and lights to make your stand shine even when you’re in the darkest of exhibit corners. Why not exhibit or market outdoors? From fetes to promotional marketing, we’ve got outdoor advertising covered. From advertising flags big and small, to outdoor counters and banners all our outdoor range are weather-proof to make sure they can withstand the elements. 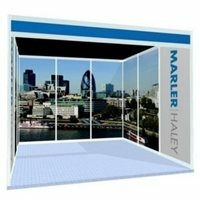 A core part of the Marler Haley business has always been our range of display and notice boards. We have six product ranges that allow plenty of options enabling you to find the perfect solution whatever your requirement. 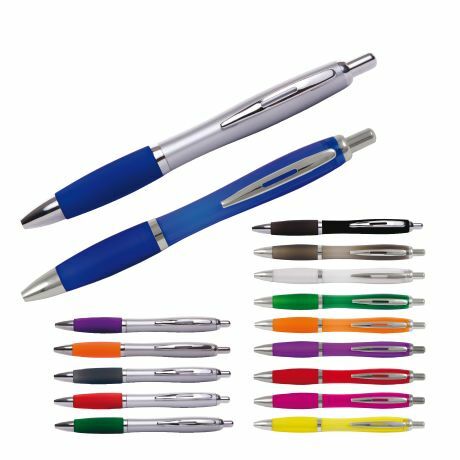 Covered in Velcro-friendly fabric, they are available in a wide range of colours and sizes. We also offer you the option of adding eye-catching graphic panels to set your stand apart! 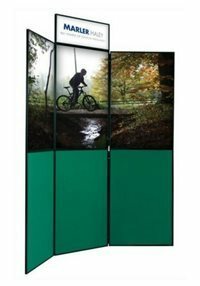 Our display boards are also perfect to use as partitioning systems as well as for general display. Our collection of display boards includes those that are suitable for displaying lightweight items as well as those that are ideal for framed artwork or heavy items. If you're looking to reduce the impact you have on the environment, then our range of eco-friendly displays are just what you need. Our environmentally friendly displays are made up of recyclable graphics and base units so when you're finished with your display, it doesn't end up in landfil - nearly all can be recycled instead. What's more, there's even a free recycling scheme to take advantage of. Get rewarded for every eco-display or standard display you send back to us for recycling. Make sure to talk to one of our team to find out more. 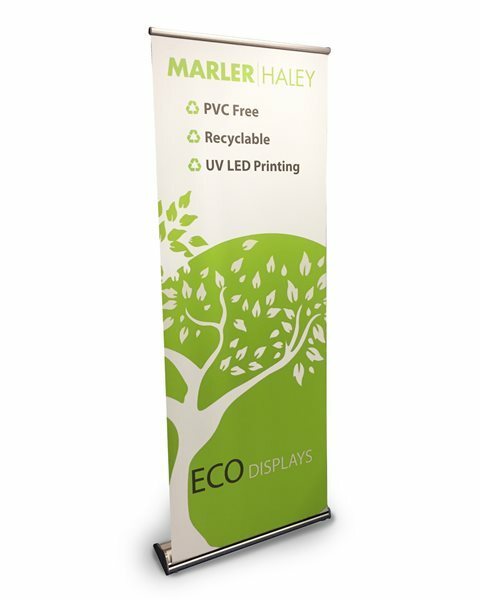 We offer a range of design options to help you create the artwork for your banner stand. From our quick and easy online banner stand design tool which includes a wide range of templates and styles to our custom design service, we have options to suit all needs and budgets.